(Only significant rain events elaborated). Monday 1st September, the current UAC moves West/ North-Westwards and brings Heavy Rain to West MP, Eastern Gujarat region, South Gujarat Coast and parts of North Central Maharashtra (Aurangabad, Jalgaon, Akola, Nasik). Monday Night into Tuesday 2nd, Showers increase in Coastal Saurashtra. Monday and Tuesday due to moisture inflow, patches of rain are possible in North Rajasthan, Haryana, Punjab, and Delhi NCR. Tuesday Night/Wednesday 3rd, rains move into rest of Gujarat including Kutch. Increase in rains in NW India States. On 2nd September, from the pulse from the erstwhile UAC, AS-1 forms as a Low near the West Gujrat/Pakistan border. Kutch and adjoining Sindh may get heavy showers in patches. 2nd September, Rains also move into South and SE Sindh, Upper Sindh, adjoining Pak Punjab, almost covering roughly the Eastern half of Pakistan. ( Sukkur, Hydreabad, Nawabshah included). Punjab cities ( Lahore, Gujrat, Multan ) can get thunder showers. Thunder Showers in Karachi Tuesday Night through Wednesday. There is a possibility of heavy rains on Saturday next, but we wait before confirming. Heavy Falls in MP on all days. Delhi NCR: The odd shower on Monday in some patches. Rains increase on Wednesday and regions may get around 20-25 mms. Mumbai: Reduced rain intensity on Monday, with some evening showers could be heavy. Rains around 35 mms. Lessening intensity on Tuesday and Wednesday. Pune: another Thunder shower on Monday, and some decrease in rains from Tuesday. 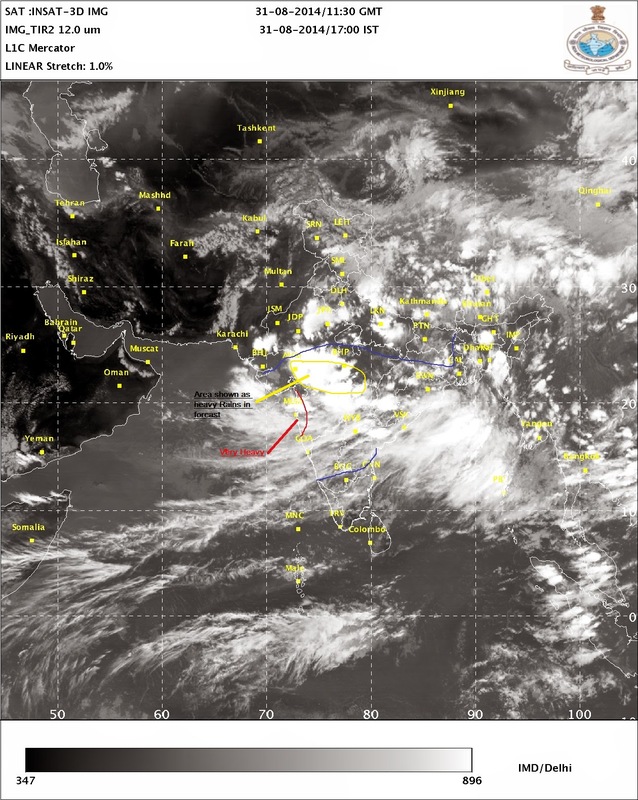 No significant rains developing around Hyderabad. Seems that the axis shifting South has forced the Bay winds to push eastwards into North India plains. This may delay the earlier announced formation of BB-8. 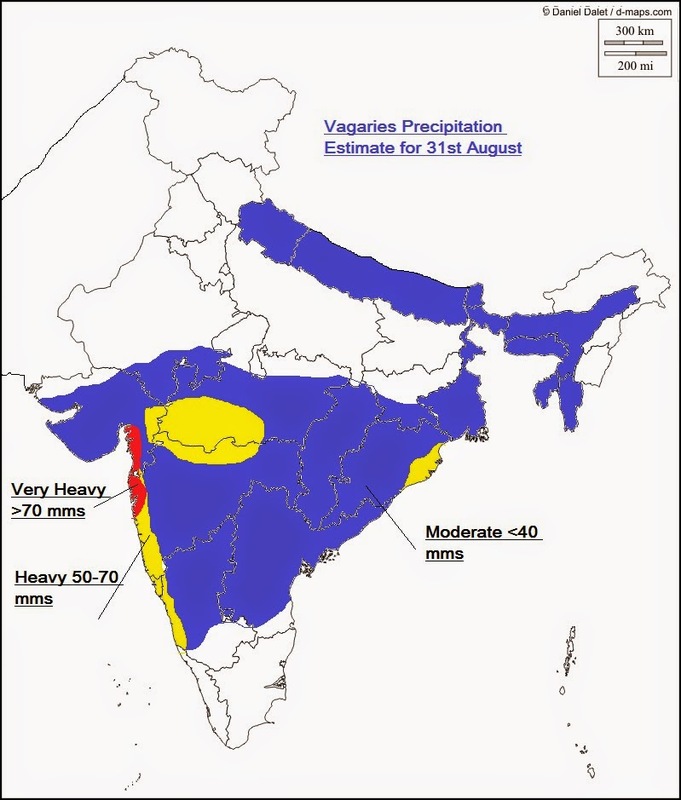 Maharashtra Rains as on 31st August Morning: Harnai 194 mms, Ratnagiri 172 mms, Dapoli 168 mms Shriwardhan 153 mms, Matheran 83 mms, Lonaval 47 mms and Mahableshwar 42 mms. Some of the Heavy Rainfall amounts in cms from Saurashtra as on 31st Morning: Kalavad (dist Jamnagar) 14, Upleta (dist Rajkot) 14, Ranavav (dist Porbandar) 14, Jetpur (dist Rajkot) 13, Kutiana (dist Porbandar) 11, Rajula (dist Amreli) 11, Gandhidham (dist Kutch) 9, Dhoraji (dist Rajkot) 9, Savarkundala_arg (dist Amreli) 8, Una (dist Junagarh) 8, Umrala (dist Bhavnagar) 8. Mumbai Rains for last 24 hrs ended 5.30 pm IST 31st August: CST Terminal 122 mms, Dadar 135 mms, Worli 115 mms, Grant Road 140 mms, Colaba 130 mms and Vagaries 140 mms. Guess September monsoon revival - especially over NW India - GUJ/RAJ/MAHA will spell doom for NE monsoon. SWM may again enter into extended phase. Hyderabad received showers this morning as per Rajesh Sir's prediction. And this afternoon some parts of Hyderabad received heavy showers. rajesh sir the pakistan meteorological department's website is closed in pakistan and people are in real need of the weather forecast of the current weather system in gujrat so please update about its effects in sindh that how much rainfall will occur in sindh during 1st week of september????? is there any threat ??? Coastal and Southern Sindh will receive heavy rainfall in many regions Badin, Karachi, Mithi, from monday to wednesday while rains decrease from thursday. Rains over karachi is on Monday to to wednesday. Central and upper Sindh regions larkana,Hyderabad,Mirpur khas etc will get showers on monday to thursday. Though some patches will see heavy rains, local flooding may occur in those areas. Refer to Pakistan Met Dept Bulletin for latest up dates. Thanks rajesh sir for your reply,it means that the lower southern sindh is going to get heavy rains in that period and can you tell us one more thing please that is there any possibility of heavy rains in central and uper sindh???? sir when monsoon is going to withdraw from the region???? rajesh sir pls tell me when monsoon is going to start withdraw from the region esp frm sindh gujrat region??? ?